We may not fully understand how the appearance of our mobs affects the game, but you should listen to this topic. Anbu Ninja MCPE 0.14.0 / 0.14.1 / 0.14.2 / 0.14.3 skin will be a nice change of scenery for you. He’s pretty sullen. Normal black base background and creeper mask. What it will change in your character is unknown. But now there will be something quite unusual in minecraft pocket edition. 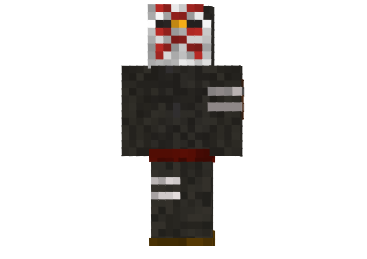 You should download Anbu Ninja skin so that something on Minecraft 0.14.0 / 0.14.1 / 0.14.2 / 0.14.3 changes. You can not always play the same thing. All skills are lost, vigilance is lost. And the interest is fading away so quickly. It is completely uninteresting. So try playing with this skin. And then it will be possible to combine it with some mods installed through the blocklauncher, so it will be generally convenient.